No one knows better about an experience than a person who has gone through the same experience. Ask people why they do what they do … especially people involved in protecting, saving, and helping people overcome traumas of some form. The twelve step program relies on people to sponsors newcomers. Joyce Meyer, the televangelist who experienced parental sexual abuse since a child shares her experience to help others. Many people step up to help after their healing. Joel Osteen inspires people to move past other people’s judgments of you so you can do what you know what you must do. Psychology shares the same idea. As do I, by my actions as well as my words. Considering all the challenges and trauma I experienced as someone with a personality type that is a very small minority in the U.S., 3% to 5%, in retrospect, from what I have learned, it is understandable why I experienced what I did. Much of the trauma resulted from a lack of understanding and also from low “Respect Levels” that enabled disrespectful and even harmful acts to be carried out against me. Sad to say, as much as I am a highly sensitive being who is greatly disturbed when anyone or anything is hurt, harmed, or killed, my take charge personality rebelled and acted out against others, sometimes not even against those who harmed me. Healing took a long time because for my personality type, I had to understand first. Or at least I thought I did. I learned a lot in the process, including for me, that understanding was not enough because sometimes understanding is not possible for any number of reasons. For me, logic, practicality, and logic took me so far in my healing. What finally brought the acceptance and peace I sought my whole life came from within. And within is where I found a connectedness I have never known. For me, raised a Catholic, the hypocrisy I saw pushed me away from God. I looked to many alternate sources, but for me the solution was studying the Bible for myself and developing a personal relationship with God. I don’t know what you may have gone through, but I do know what it means to be on the outside looking in, to be taken advantage of in all kinds of ways because of wanting to be accepted, valued, and loved. However, that mentality, a low “Respect Level” for myself turned me into a people-pleasing puppet until at different times I burst out with pain and anger at not being able to be me … and still be accepted, valued, and loved. The chaos I left in my wake then haunted me because I did not want to hurt people. I just wanted them not to hurt me. But this world, with disrespect as the dominant global cultural belief, is all about hurting others for our own or someone else’s benefit. The reality I finally saw was that when we do not value … respect others and the world that supports our existence, we contribute to our own dysfunction created by disrespect. We add fuel to that fire of destruction. 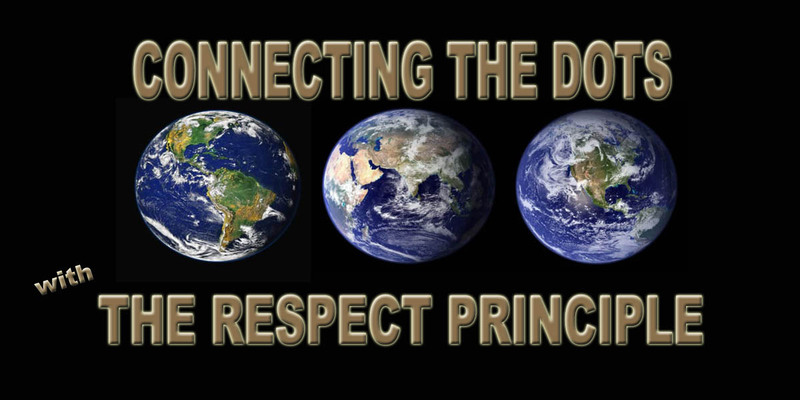 Connecting The Dots With The Respect Principle provides us the freedom to not have to like everyone, to not have to judge, or approve of anyone. Instead, the concept is an empowering live and live mentality. The only time that changes is when someone or some group’s prejudice is harming others and then we have to step in to protect those who, for whatever reason, cannot protect themselves yet. This past Sunday, Joel Osteen’s sermon inspired me to write this blog piece so you understand the Connecting The Dots With The Respect Principle concept, company, books, products, and global initiative were born out of lifetime of pain, finally abated with understanding and healing that I need to share … to help others who have felt alone, misunderstood, rejected, abandoned, and even harmed sexually and physically. You are valuable … worthy of respect … simply for being a life. And beyond being valuable … respected … you are loved unconditionally by God no matter what you have done. That’s the big difference between humans and God … he not only forgives, he is willing forget! Cool, eh? So, keeping that in mind, may you open your heart, mind, and spirit to the peace available to you. No worries. All will be well because by reading this you have already taken the first step. This entry was tagged Connecting the Dots ... with The RESPECT PRINCIPLE, Dominant Global "Disrespect" Mentality, Helping Others Because You've Been Through It, Inspiring words, Motivational Story, The Healed Becoming Healers, Who's worthy?. Bookmark the permalink.